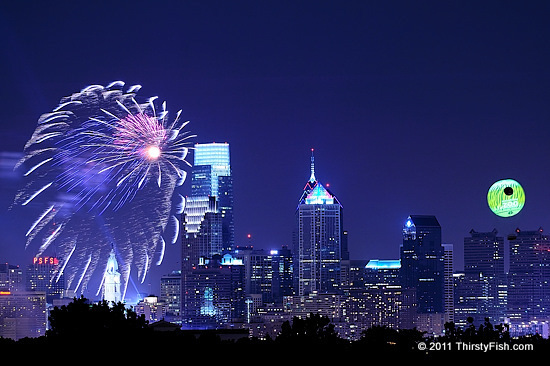 This photograph was taken during the 2010 Fourth of July celebrations. The green sphere on the right is the Philadelphia Zoo balloon. You can see the 2011 Fireworks Photo in a later post. Why is Charlie Sheen three times more popular than the Declaration that started it all? The most potent and consequential sentence in the text of the Declaration is: "We hold these truths to be self-evident, that all men are created equal, that they are endowed by their Creator with certain unalienable Rights, that among these are Life, Liberty and the pursuit of Happiness". What are we doing with our unalienable rights? Is "pursuit of happiness" obsessing about the tragic downfall of a television star? While some might explain all this using concepts from Psychology, such as emotional contagion, there is probably a much simpler explanation. Charlie Sheen dominated the American media and mainstream news networks for a couple of months earlier this year; to the extent that "real news" was overshadowed or even dropped. The real question here is, why does the media push such stories? Is it just for advertising dollars? Or, is it because of a conspiracy to mislead and de-educate the populous so that they can be ruled over with ease - as Kings have done throughout history? Why and against whom was the Declaration of Independence signed again?